Diabetes in the UK has now topped four million people. This is 1 in 16—a lot. Our own opinion is rather severe. We believe the British National Health Service (NHS) recommendations are the primary cause of this. So is the British National Health Service recommending a diet known to cause type 2 diabetes? Essentially, this is the case. Diabetes is the inability to metabolize glucose, and for all practical purposes, starch is almost fully converted to glucose in the intestines. Same story for fruit, except fruit is a mix of glucose and fructose, but the impact is similar. 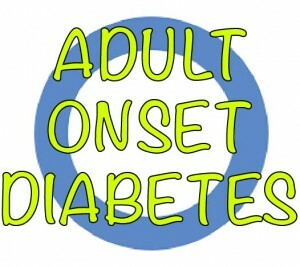 Also known as adult onset diabetes or AODM, is usually defined as an inability to properly metabolize glucose (sugar). Hence sugar levels build up in the blood. This is, in fact, the definition of the disease: chronically high circulating glucose levels. You do not need to be a highly trained specialist to figure out that if glucose levels are chronically high, making them higher by eating more glucose is not a solution. This is plain common sense. You would no more give excess glucose to a diabetic than alcohol to an alcoholic—at least not to one you were hoping to cure. We had it right in the US. Why did we change? In the US in the late ‘60’s type 2 diabetes was relatively rare. However, the federal government the nation’s health was deteriorating and decided to pronounce itself an authority on nutrition. Panels were impaneled, politicians pontificated, and behind the scenes, lobbyists scurried about hoping to throw things their way. The big winner was the starch industry (think breakfast cereal), with grain-based products being practically elevated to the level of wonder drug. On the other hand, fats, especially saturated fats, were pronounced the root cause of all things evil—nutritionally at least—and all but forbidden. 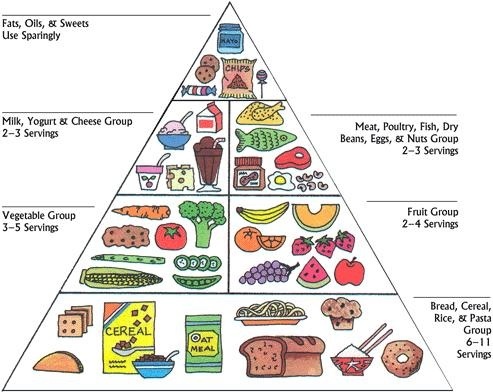 This resulted in the famous food pyramid, with a huge portion devoted to starch, and only a minuscule bit at the top left for fats. Now this is not a good diet for anyone. Other than raw energy, starch has little in the way of nutritional value. However, for a diabetic, it is a disaster. Besides the obvious absurdity of attempting to impose a standard diet on people with a huge breadth of needs, the high starch change launched the diabetes epidemic in the US, and likely the Alzheimer’s one as well. 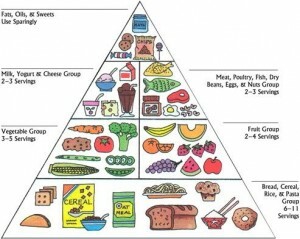 It does not appear that the UK adopted anything like the food pyramid as national advice. In fact, prior to the late 1990s there is a nearly complete paucity of dietary advice of any sort form any UK organization. Perhaps Brits have more sense that to listen to government advice. However, by 2,000 the strange “give ‘em glucose” recommendations seems to have been put in place in the UK as well. The Brits are not alone in this dangerous advice. Whether the British National Health Service came up with diabetic dietary recommendations on their own, or cobbled it up from some US advice is unclear. However, there was ample bad advice available in the US to cobble it from. Is there hope this will some day be straightened out. This harmful advice filters down to clinicians in both countries, and this is very detrimental. The advice to reduce saturated fat is equally misguided. Fat, and especially saturated fat, has never caused adult onset diabetes. In fact, in trial after trial, those fed high-fat, low-carb diets immediately reversed their tendencies toward diabetes, meaning their circulating glucose dropped. When the opposite diet was applied, one very similar to the British National Health Service recommendation, quite the opposite occurred: glucose levels rose. By applying the dietary and exercise protocols found elsewhere on this site, Dr. Mike has achieved a cure rate of 100% on patients that presented with type 2 diabetes. In some cases, people were cured within three months. It should be borne in mind that maintaining the cure is a lifetime commitment, though well worth it. How about Insulin-resistance vs. Fat (saturated, unsaturated)?